Review: 'Her Smell' Is Raw And Real Alex Ross Perry's visceral, difficult film about a visceral, difficult punk singer (Elisabeth Moss) unfolds in a series of bracingly raw and uncompromising set-pieces. 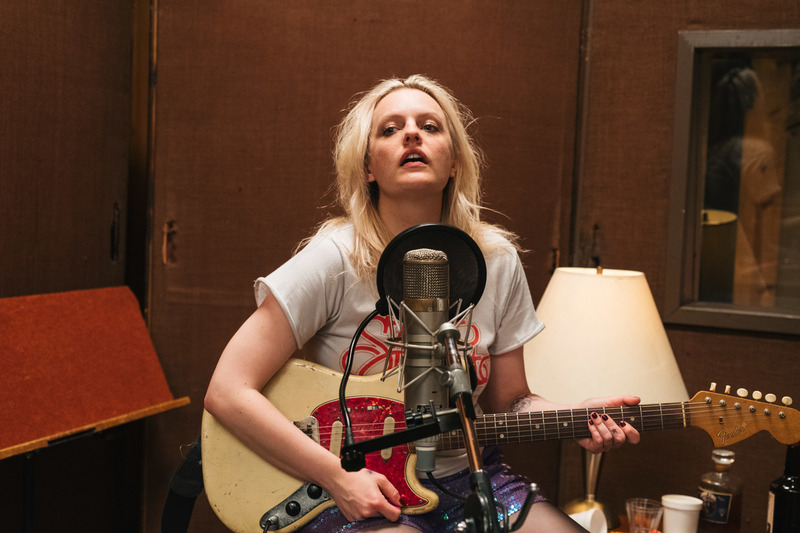 Elisabeth Moss plays a self-destructive rock star in Her Smell. The films of Alex Ross Perry thrive on discord, whether their rancor is couched in the high-falutin' language and privilege of literary comedy, as in Listen Up Philip, or festering in the hothouse confinement of Queen of Earth. Even Perry's last film, the uncharacteristically subdued slice-of-life Golden Exits, positioned itself as a subtle challenge for audiences to get on its wavelength. His work occasionally tips into out-and-out misanthropy, but really his instinct is to engage in the pricklier extremes of human nature, when we drop our guards, dispose of all politesse, and just let 'er rip. In that respect, it was perhaps inevitable that Perry would get around to making a thrillingly unvarnished film about a punk singer, specifically one in the throes of addiction and mental illness. And it was also inevitable that he would skip past the rise-and-fall arc of a Behind-The-Music biopic and start right with the low point, when gold records and Spin covers are several years in the past and just getting through a show at all is a minor miracle. In Her Smell, Perry offers scraps of home-movie footage to reveal the riot grrrl trio Something She in better times, but it's there mostly to contrast with how far the band's lead singer, Becky Something (Elisabeth Moss), has brought them all down. It also helps explain why anyone remains in her orbit. The audience has no such comfort. Though the film sprawls out over 135 minutes, there are only about five extended setpieces in it, when the characters are breathing each other's stale air and we're stuck in there with them. Against the ambient thrum of feedback, the first and most difficult sequence takes place backstage after a Something She show, when Becky's anxiety and addiction are most easily triggered. As she rants and raves incoherently, other figures come into view: Her bandmates Marielle (Agyness Deyn) and Ali (Gayle Rankin), who are wearily familiar with her excesses but visibly frustrated by them; her manager Howard (Eric Stoltz), who's startling to lose the music empire her music built for him; and her ex Danny (Dan Stevens), who brings in the baby daughter she's too screwed-up to mother. The child is her salvation, but it might not be enough. The industry itself will not wait on her, either. In the next setpiece, she's listlessly gobbling up studio time that's been reserved for another pop-punk band (Cara Delevingne, Ashley Benson and Dylan Gelula) — emphasis on the pop — that's primed to record radio-ready hits without the hassle. The younger women worship Becky, who's been imagined here as a Courtney Love type leading a less sturdy Sleater-Kinney trio, but their inevitable role is to replace her rather than reinvigorate her. The suspense here isn't whether Becky is going to hit bottom, but whether she has the will to pick herself up and make amends with the many people she's damaged — not least of all herself. Like most finely crafted punk singles, the film builds a hard shell around a gooey center, tucking a big emotional (and even sentimental) hook around repellent blasts of feedback and distortion. There are times through Her Smell when it hardly seems worth tolerating Becky's tantrums, which Perry and Moss, working together for the fourth straight time, render with a messy disregard for how viewers might feel about her. Perhaps they'll see in her a favorite artist who'd fallen on hard times and sympathize, or perhaps they'll simply be exasperated by her ugly intransigence. It's the truth of Becky's behavior that matters most to the filmmakers, and there's integrity in that. For all its deliberate rough edges, however, Her Smell is a journey through hell and back that feels more gratifying for being difficult. In order for Becky to arrive at any kind of peaceful place in her life, however fragile and impermanent that might be, she has to contend with the personal demons that hold her down and distance her from those most willing to help. Perry and Moss are not content to frame Becky as a rock-star burnout who partied hard, left some wreckage behind, and walked away with a memoir and a reunion tour. They're shooting for something more visceral and real, and infinitely more earned.